Another one of those strange blog posts featuring a set where I’m actually a performer rather than spectator, but there are three other acts to cover too – I’ll cross the potential for self-reviewing when I come to it! Stars Bothering on Sunday is – as I’ve written before – an amazing way to round off a weekend. An early start and early finish means you don’t need to be out late if you need to get to bed early for work in the morning, and has introduced me to loads of ace new bands. Tonight was no exception – three familiar bands on offer, one of whom breaking in a new substitute fiddle player, one I’m part of, and of course the Star Botherers themselves. The new band for me was Swifty’s New Front Teeth who are old friends of Mark’s. Being in an unfamiliar setting they were a bit pensive before hitting the stage, so when it came to discussions around running orders they were keen to get on first, so set about sorting out the stage. For just the three of ’em, electric guitar, bass and drums, they make a big noise – I cunningly clocked their set list before they started, although that’s bitten me in the arse now because I didn’t make any notes, and because of the ambitious idea of squeezing four bands into a little under three hours they had to drop a few from there. D’oh! Just Friends kicked things off in fine style, and those pre-show nerves seemed to evaporate in no time. 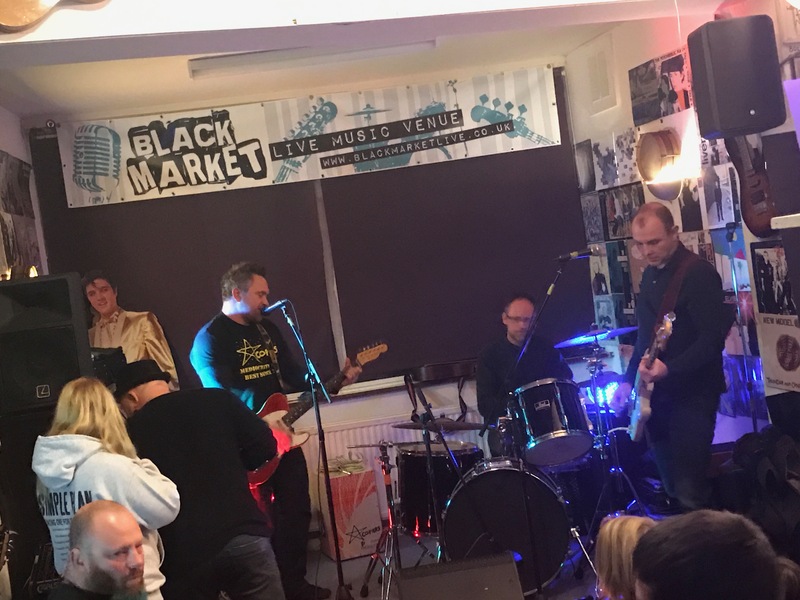 Next up was Dalliance and straight into My Hero – it was going down really well with a healthy sized crowd in the Black Market venue front bar. Whilst we know only too well how friendly the crowd is there, it must be daunting for folk playing there for the first time. 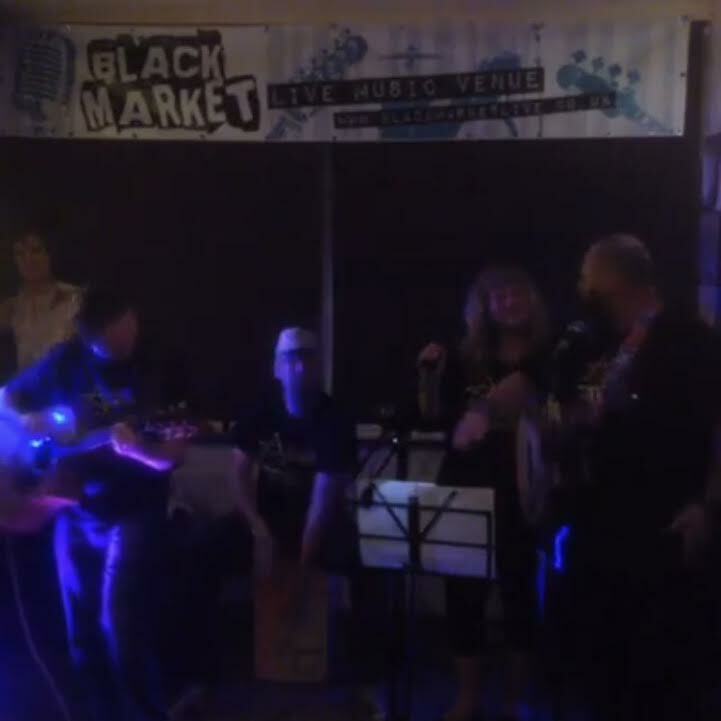 I particularly enjoyed a rocked up cover of Starsailor’s Good Souls – it worked really well. This is where my recollection gets a bit rubbish, I definitely recall All The Small Things, some amazing guitar work for Enter Sandman and a finale of The ’59 Sound. Cracking set. You guys need a Facebook page! The Star Botherers were up next – a quick adjustment of the stage and they were ready to crack on. With time pressing they went for a fairly quick set, which is a pity (but for selfish reasons appreciated! ), kicking in with Just Around The Corner (Dave, perhaps mindful of the kids in the audience, was very restrained in ‘the bit at the end’). Ringing in Sick was next, and as Bart had spied Kev in the audience it helped him decide his next song. The Hubball Shuffle was duly launched into, illiciting some of the dancing chronicled within the song. They finished up with Bad Guys which I know Joel had specifically requested from Bart before the gig started, it was dedicated to him and he seemed suitably pleased! It was fun watching the guys from Swifty’s New Front Teeth seeing them for the first time. Whilst I never take any of my ‘regular’ bands for granted, I guess you can’t help but find them increasingly familiar even if you continue to enjoy them! Next up were The Star Copiers – under the pseudonym of The Crap Stories for the evening. We got ourselves set up and thoroughly enjoyed ourselves! 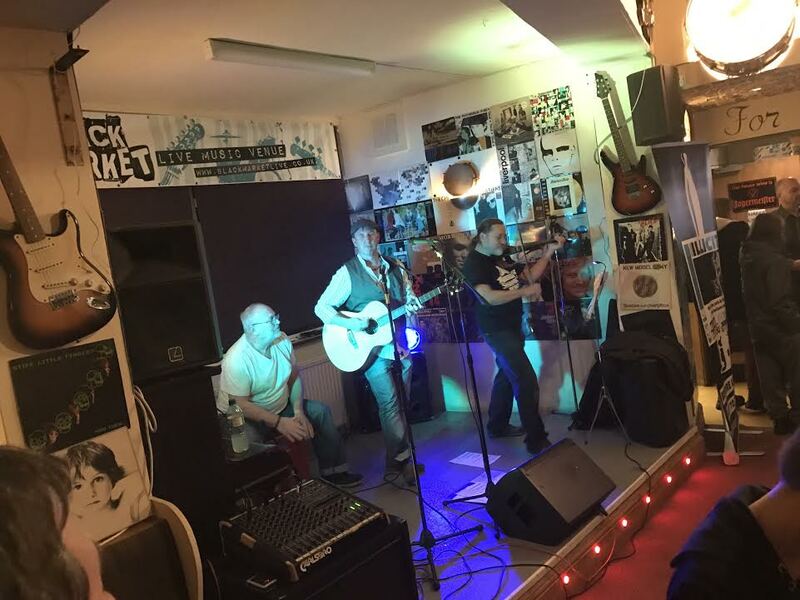 It might be that somebody proffers an objective review of the set – certainly the comments we had after were lovely – the support we receive from genuinely talented musicians we know is unbelievable and greatly appreciated. I got some more cajon playing tips from Big Bob too. We live-streamed from two locations and netted in excess of 350 cumulative views between them (!). Mark’s live stream is included below for posterity – so you can make your own mind up, if any of you are friends with me on Facebook you’ll be able to find my stream from the side of the stage too (which was oddly mirror-imaged). Excuse the crap photo, I screen grabbed the video as obviously I didn’t get to take a picture (I’m sure others did but they’ve not surfaced yet!). Which left the not inconsiderable bonus of Shanks’ Pony to finish the evening in the bar – with Helen unable to make it they’d drafted in an amazing substitute fiddle player (I think it was Rob, sorry if that’s wrong!). With just one rehearsal under his belt you’d never have known it was his first gig with them, superb. Through both watching Rob’s virtuoso performance on the violin and keeping an eye on Big Bob for cajon tips I wasn’t making notes brilliantly – I think the first track was Good Old English Folk Song, I missed the second completely! Down by the River ‘O was next, a welcome addition – I’ve not heard it in a while, it’s one Ferocious Dog used to feature in their sets quite a bit when I first used to go to see them. Byron’s Dog was next and then Top of the World which I suspect is inspired by events at Harefield Hall. Steve Earle’s Galway Girl led us toward the end of the set, pressed for time they finished up with Special Brew (no cans for the crowd, probably a good thing!). Loud demands for an encore were made, and with Dave not visible to object was delivered – so we were treated to a bonus of Fisherman’s Blues and finally Moshpit Waltz which was very loudly demanded by Bart. 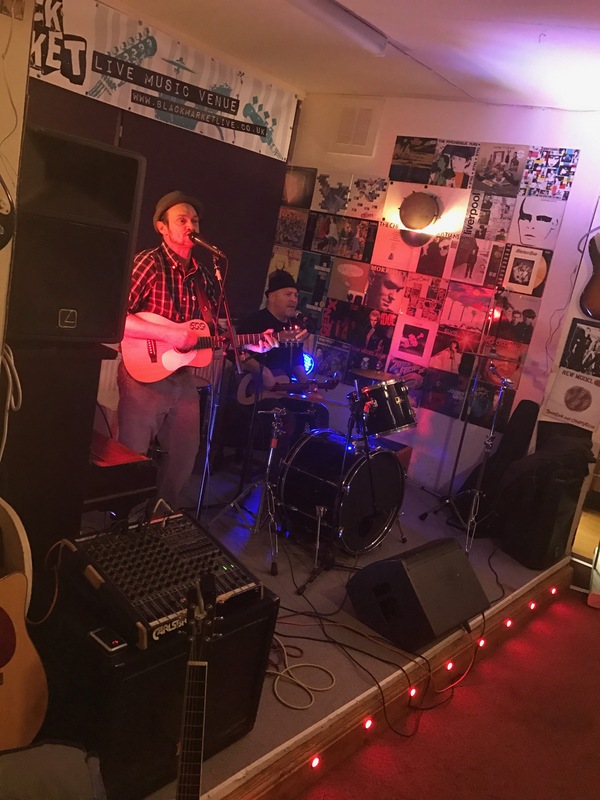 A cracking set – and whilst I absolutely wouldn’t consider describing myself as a musician, as a fellow box-banger it was brilliant to get a chance to sit and see what can be achieved with the cajon – I’ve got a lot to learn, but I’m having fun doing it! There was a gig in the main room following this evening, and I really wanted to stick around to check it out but alas an hour drive and work in the morning and a few bits to sort around the house like washing and stuff meant sensible-ness had to hold sway. What we heard coming from the main room on the way out sounded awesome though. Whilst it should come as no surprise really, spending the amount of time I do amongst such splendid gig-going and gig-playing friends, the support and encouragement we get as pseudo-performers from them is incredibly moving and appreciated. 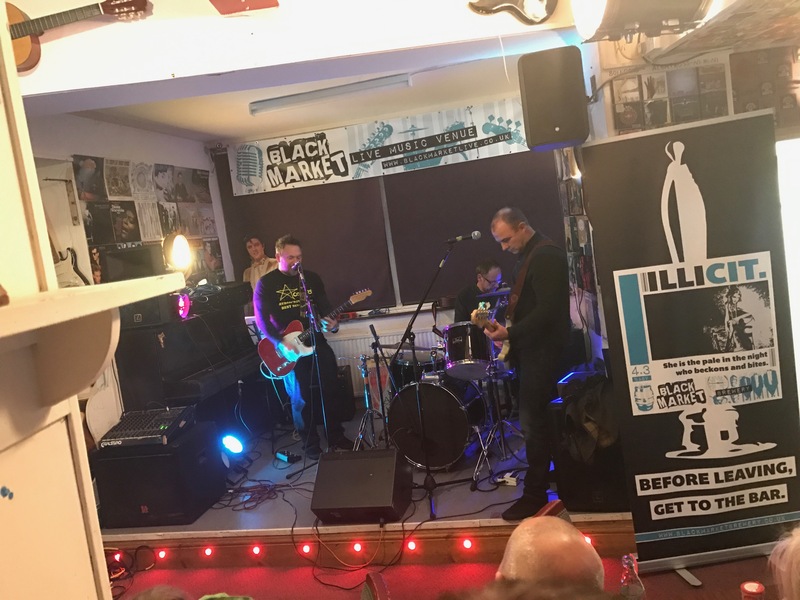 It’s fascinating and very humbling to be on ‘the other side’ so to speak even for such a relatively small gathering – I can’t imagine what a buzz bands must get infront of huge crowds!